Published on April 17, 2019 at 10:00 pm . CAMPBELL RIVER, BC, April 18, 2019 — The Campbell River Hospital Foundation supports about 20% of hospital purchases each year. 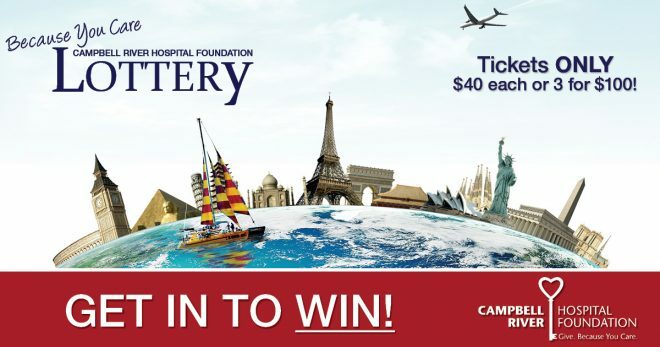 You can lend your support to quality health care by entering their annual lottery; there are only 2,750 tickets, at $40 each or sets of 3 for only $100. The $20,000 Grand Prize for the Lottery is an enticing $10,000 Cash and a $10,000 Travel Voucher. The 2nd prize is $1,000 Cash and One trip for two (2) to the Hyatt Ziva Resort, Los Cabos, Mexico and the 3rd prize is $1,500 Cash and One return trip for two (2) people to any scheduled WestJet destination. Tickets are now available and can be purchased online and with various retailers. Details are available on the Foundation’s website. Winners will be drawn on May 24, 2019. The Campbell River Hospital touches the lives of more than 54,000 people in the community and the North Island. There are just over 400 babies born in the hospital each year. Each year, the hospital performs over 35,000 x-rays and 3800 mammograms. On average, there are more than 30 ultrasounds performed each day; that is more than 11,000 each year. The hospital has one of the most efficient ICU’s in the Province. In 2018 alone, our ICU had more than 3,600 ventilator hours. Our Laboratory performed 41,000 venipunctures in our outpatient Lab, and 79,813 pokes on Emergency and admitted patients. Published on March 28, 2019 at 12:00 am . Only hours remain… don’t let this one fly away! Or take $250,000 tax-free cash! Just imagine what you could do-lah with all that moolah. And start dreaming of your summer holidays when you have $300,000 in travel gift cards and cash to spend. Don’t wait! Tickets are selling fast, and the Choices Lottery sold out early last year. 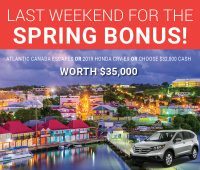 When you order today, you’ll get in the Early Bird Draws – with $300,000 in total cash to win – and the Grand Prize Draw – with a $2.2 million tax-free cash option! 8 Grand Prize Choices. Live where you love. Or take the cash and become a multi-millionaire. There’s something for everyone in this year’s BC Children’s Hospital Choices Lottery! Published on March 26, 2019 at 1:00 am . Treat every year like it’s the best year of life! It’s a $300,000 Early Bird, and you could win it! 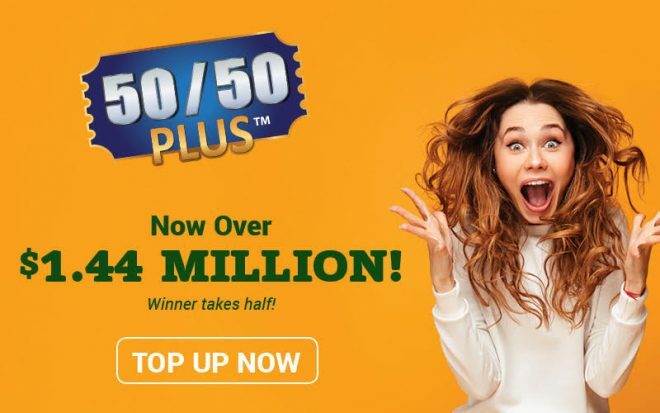 Plus, with 50 extra winners, there’s $50,000 in bonus cash to win, as well. Or choose a Car and Travel package – win a 2019 Tesla Model X and a 5-night Private Jet holiday to Maui. Or become rich in an instant – by choosing $250,000 tax-free cash. Get your Choices Lottery tickets today! If you get your Choices Lottery tickets this week, you won’t just be in for the Early Bird draws – you’ll also get in the Grand Prize draw, and you could win your choice of 1 of 8 amazing packages! Choose a luxurious Red Tree home in South Surrey, in Elgin Estates – the biggest part of a $2.8 million Grand Prize. Or choose from other homes in South Surrey, Vancouver, Squamish, Kelowna or Victoria. Live where you love. Or choose $2.2 million cash – and start your new life as a multi-millionaire. Whatever your dream is, it’s only a winning ticket away! BC SPCA Lottery 50/50 Tickets are 90% sold. Don't miss out! Published on March 25, 2019 at 9:00 pm . BC, March 26, 2019 — The BC SPCA Lottery’s 50/50 tickets are 90% sold. This year’s 50/50 is doubled to up to $100,000 for one lucky winner, so order your tickets while you still can! 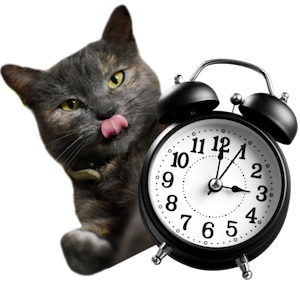 Don’t miss the chance to change your life and the life of an animal in need. When you play, the animals always win! For tickets and for more information, visit lottery.spca.bc.ca or call 1-855-205-5998. Ticket purchasers must be 19 years of age or older and tickets can only be sold in B.C. Published on March 22, 2019 at 2:00 am . Enough travel to last a lifetime, or enough cash to make your dreams come true! In total, there are $350,000 in Early Bird prizes to win this year, including $300,000 in cash up for grabs. 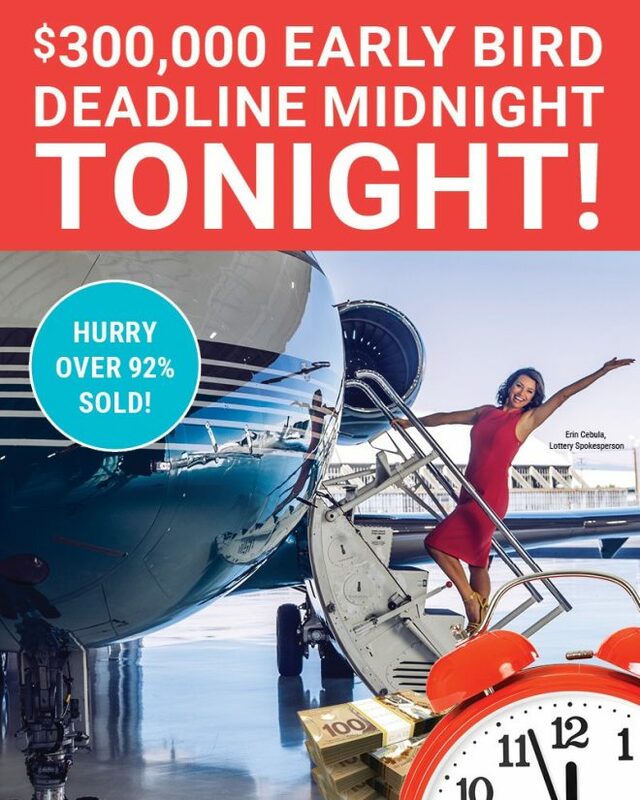 When you order before Midnight, next Thursday, you’ll also be automatically entered into all this year’s remaining draws – including the Grand Prize Draw, where you can win 1 of 8 incredible Choices, including a $2.8 million dream home package or $2.2 million cash. Published on March 22, 2019 at 12:00 am . CAMPBELL RIVER, BC, March 22, 2019 — Back for 2019, the Campbell River Hospital Foundation supports about 20% of hospital purchases each year. You can lend your support to quality health care by entering their annual lottery; there are only 2,750 tickets, at $40 each or sets of 3 for only $100. The Campbell River Hospital Foundation funds vital, state-of-the-art medical equipment and continuing education for their healthcare professionals. Campbell River Hospital is the first point of referral for emergencies and illnesses including heart attacks, strokes, respiratory problems and all other diseases. When you support the Because You Care Hospital Lottery, you help to ensure that the Campbell River Hospital is in the position to properly respond to the community’s health care needs by providing the diagnostic treatment and support programs required. Funds from this year’s lottery will be supporting women’s health and will be used to purchase a Hologic Myosure Tissue Removal System. This system provides clear visualization into the uterine cavity, can resect unwanted uterine tissue with the use of a blade and fluid management system, provides better tissue contact for efficient tissue removal and to minimize the risk of perforation, which maintains uterine form, uterine function is preserved and collected specimens intact. This one system helps with many procedures and treats a wide range of intrauterine pathologies. It will also go towards the purchase of a Hematology Slide Review System for our Laboratory. This system performs automated digital microscopy morphology analysis and has software that is designed for remote access, competency testing and education. It will increase productivity analyzing blood samples, digitally, with a high degree of reliability and accuracy. It will offer better support for rare or unusual cases for patients with urgent care issues. Since 1994, more than $8 Million has been raised to support state-of-the-art medical equipment purchases, special projects that help enhance the service and treatment of patients and residents and continuing education for Campbell River Hospital’s healthcare professionals. We believe in our doctors, medical staff and professionals who make the hospital a caring place. Your support of the Campbell River Hospital Foundation helps to make a profound difference in quality health care for Campbell River and North Vancouver Island. 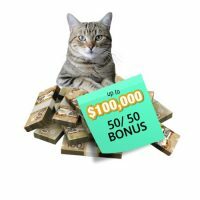 BC SPCA Lottery 50/50 Tickets are Going Fast! Published on March 11, 2019 at 12:00 am . 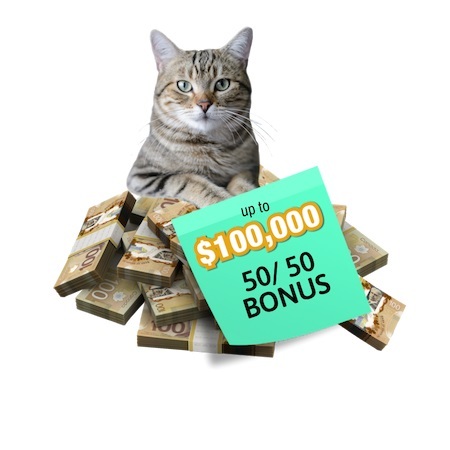 BC, March 11, 2019 — After just one week of sales, tickets for the BC SPCA Lottery 50/50 are more than 50% sold! This year’s 50/50 is doubled to up to $100,000 for one lucky winner. Published on March 8, 2019 at 12:00 am . VANCOUVER, March 8, 2019 — It’s the last day for this year’s final Bonus draw in the BC Children’s Hospital Choices Lottery! 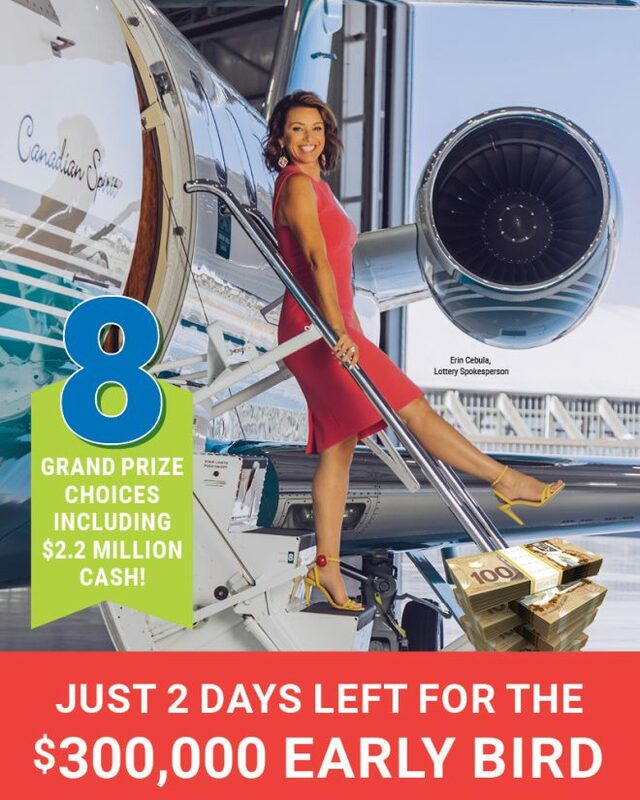 Order your tickets to get in a $35,000 draw – plus the $350,000 Early Bird and the $2.8 million Grand Prize Draw, as well. Win and choose your very own Spring Bonus: Car, Travel, or Cash! Win 1 of 8 Grand Prizes! Which is your favourite? 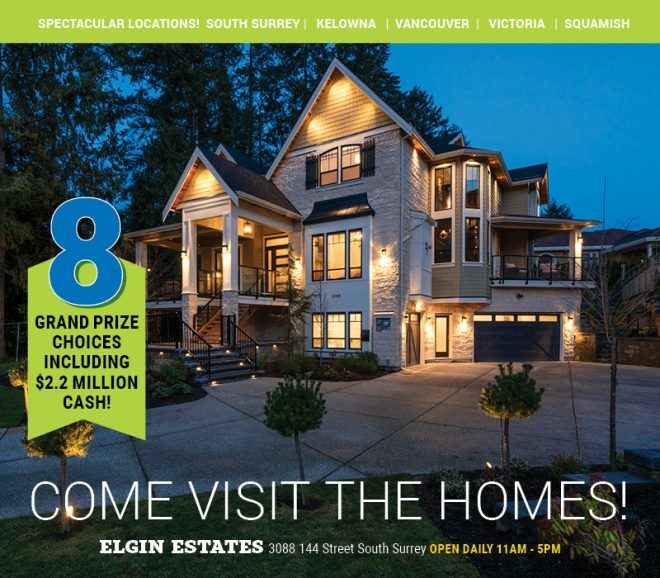 The ‘Elgin Estates’ home package in South Surrey is worth over $2.8 million… or there’s a Squamish + Vancouver condo package, or a gorgeous city living package in English Bay, downtown Vancouver… or how about a home in downtown Victoria, or a house in Quail Ridge, Kelowna? 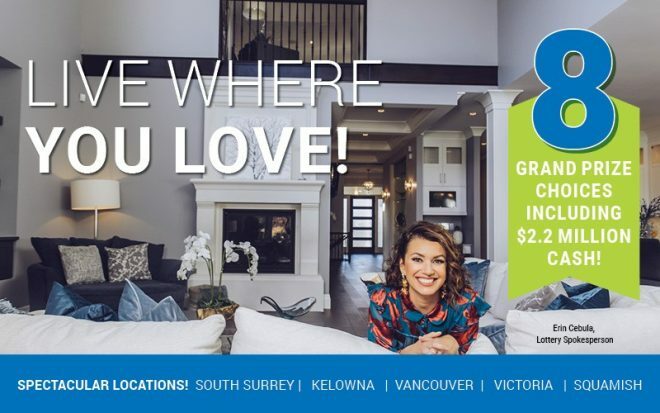 Or there’s a South Surrey + Kelowna package, with two homes to serve you year-round… or a ‘Greystone’ home package in South Surrey, which comes with furnishings, a BMW, and $1,000,000 CASH. Win big, choose the home and the lifestyle you’ve always dreamed of. Relaxing Okanagan paradise, exciting city vibes, or serene suburban living in 6,000 square feet. Live Where You Love. And don’t forget about the huge Early Bird! There’s $350,000 in prizes to win – including $300,000 in total cash up for grabs. Win Vacations for Life, a Private Jet Trip to Maui + Tesla, or a $250,000 cash for this year’s biggest Early Bird winner. By purchasing a lottery ticket, you’re helping shape the future of child health. That’s because proceeds go toward research initiatives at BC Children’s Hospital – supporting over 1,000 of the most daring thinkers in science as they work to pursue new knowledge. 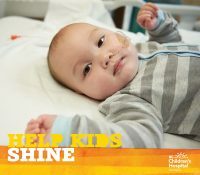 Their discoveries are then translated directly into improved care to benefit kids within the hospital. 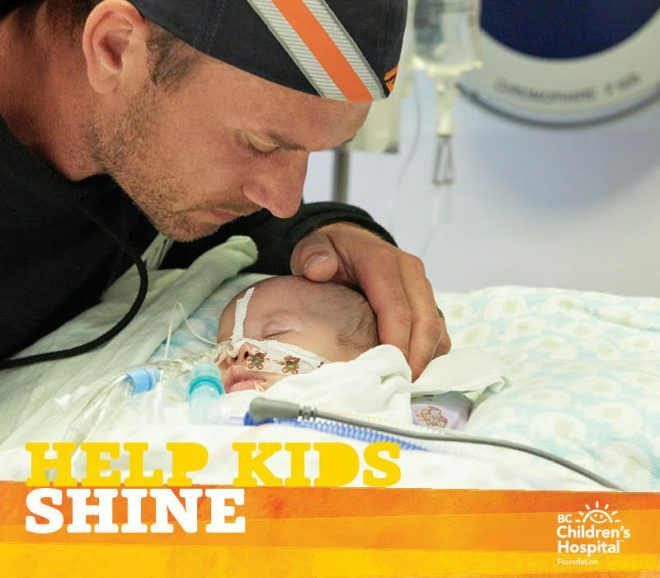 As the only hospital in the province devoted exclusively to kids, over a million count on BC Children’s for care they often can’t get anywhere else. And thanks to your support, we can help improve their lives today and define the future of children’s health care for generations to come. By supporting our lottery, you’re helping make more breakthroughs a reality. Choices Lottery: Spring Bonus Deadline only 2 Days away! Published on March 6, 2019 at 12:00 am . VANCOUVER, March 6, 2019 — You have so much to play for. Amazing prizes – like our Grand Prize homes, and the $35,000 Spring Bonus Draw. And with your ticket purchase, you’re helping shape the future of child health. 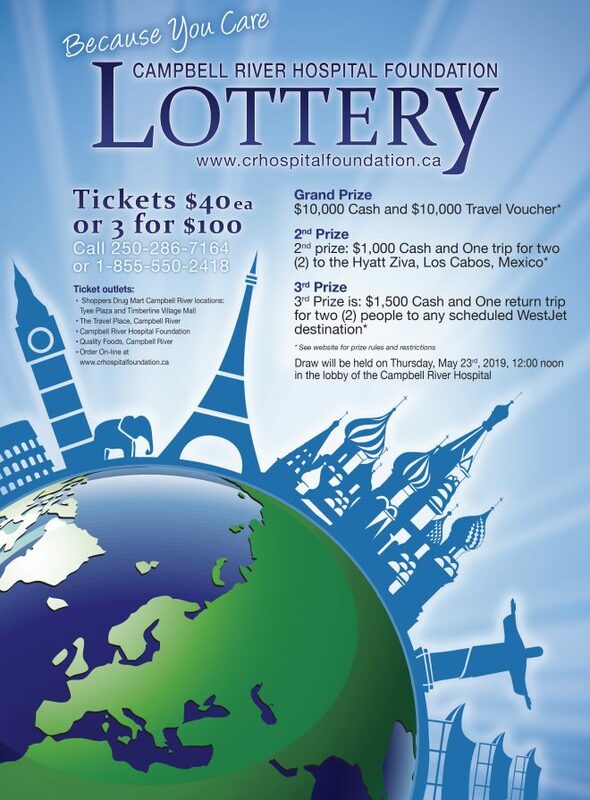 Hurry and get your BC Children’s Hospital Choices Lottery tickets today! 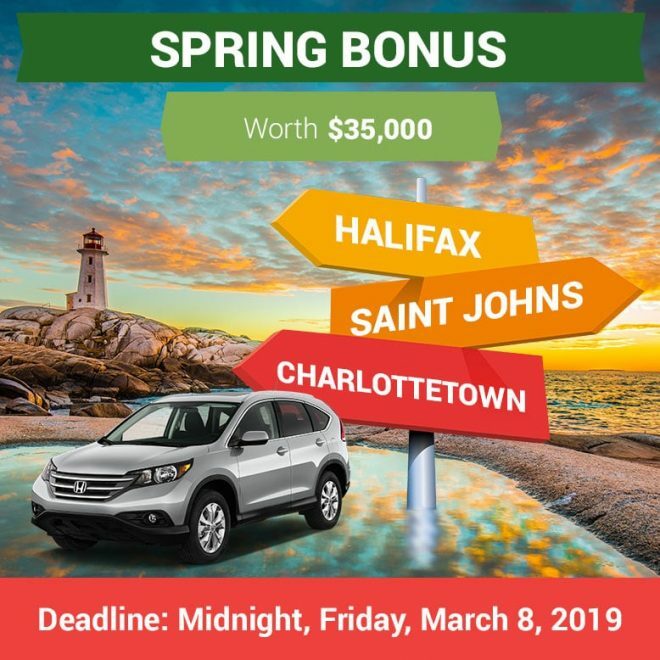 The Spring Bonus Deadline is only 2 days away – Midnight, Friday March 8, 2019. Your tickets will be automatically entered into the $350,000 in Early Bird Draws and the Grand Prize Draw, too! This could be your chance to win Vacations for Life, your dream Home in one of this year’s wonderful cities – South Surrey, Squamish, Vancouver, Kelowna, or Victoria – or $2.2 million cash! Choose early retirement, debt-free living, never-ending travel, and live where you love with 1 of 8 Grand Prize choices – including this ‘Elgin Estates’ home in South Surrey, part of a $2.8 million package, complete with a BMW X4 and $50,000 cash. Published on March 1, 2019 at 3:00 am . You can help BC’s kids. And we can all win together. 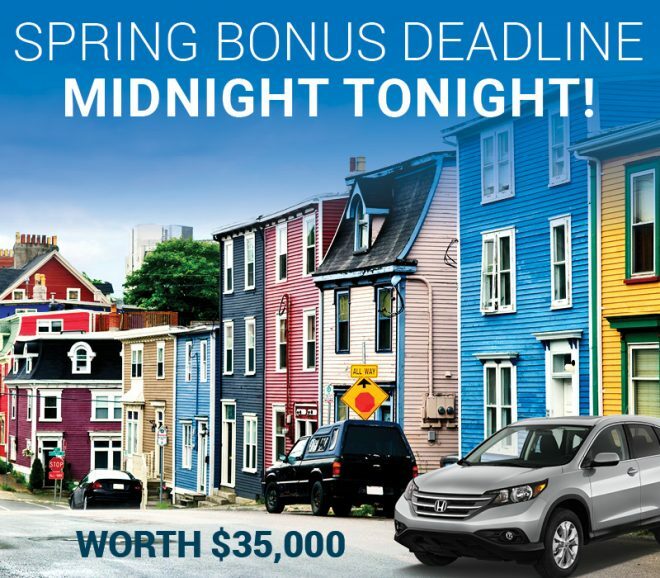 Get your BC Children’s Hospital Choices Lottery tickets and get in the $35,000 Spring Bonus Draw… for a chance to win travel, a new car, or cash! 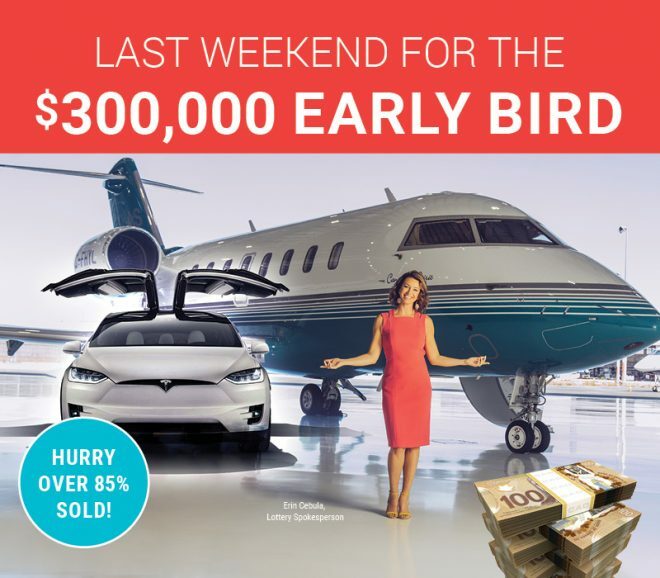 Plus, when you order early, you’re in for this year’s biggest prizes, too – the $300,000 Early Bird Draw and the $2.8 million Grand Prize Draw. Over 3,200 prizes to win, worth over $3.8 million. And don’t forget about the super-popular extra game, the Big Passport PLUS – for just $25 more, you can get in on 111 days of winning and 111 prizes. There’s an extra $362,500 in travel and cash prizes to win! Buying a Choices Lottery ticket is an easy and fun way to support important research that is improving children’s health care in B.C. When you buy a ticket, you’re ensuring ground-breaking pediatric research can continue – research that can lead to new treatments for debilitating childhood diseases, and new ways to prevent kids from getting sick or injured in the first place. BC Children’s Hospital provides expert care to more than 86,000 kids, which results in over 234,000 patient visits every year. The hospital’s campus is physically located in Vancouver, but its work doesn’t end there. The one million kids who live in B.C. and the Yukon all count on BC Children’s – be it at the Oak Street site or within their own communities through its telehealth programs or travelling clinics. Beyond our province, the research discoveries made at BC Children’s have a ripple effect that set new standards of care for kids around the world.